Written on April 29, 2009 by Kevin. Written on April 24, 2009 by Rylan & Kaitlyn. This week has been a week of imagination. Kaitlyn has been making telephones out of her bristle blocks which is always fun. We all have conversations and it's pretty funny. She sure is a chatter box when she gets on those phones. I have been pretending to give hair cuts to everyone. Just yesterday I was telling Kaitlyn how crazy her hair was and how she needed a haircut. I don't know why she was running away though. When I cut my dad's hair he turned out just fine. Last weekend we headed to one of the craft shows we used to sell at. The weather is getting really hot but we made the trip anyways and it sure turned out to be great. Our mom's friend Karlee Fuchs gave us each a new bag and even our mom got some scrap fabrics. She makes some neat bags and we definitely appreciate them. Kaitlyn's of course had doggies on it while mine had Spiderman. Well not only has the weather been warming up, so has the naughty spot over here. I haven't been too nice lately and I have been getting into a lot of trouble. Kaitlyn has had her fair share of naughty spot visits too. I think that we need to start having singing and dancing time again. That was a great way to blow off the extra energy we build up throughout the day. We have been having a lot of fun in our new garden. The seeds are growing really big and really fast. We have had a couple of the big plants already go away but we are hopeful that they will return. Our backyard may be tiny but it gives us a decent place to ride our tricycles and color with chalk. Dad gave us a covered area and everything so it helps a bit when the hot Arizona sun is beating down. Maybe one day we can have a water fight! Oh definitely a big thing happened this week. After a long investigation our mom has determined that Oreos are safe for Kaitlyn. They may be allergy safe but they are not safe from making a huge mess. Kaitlyn is a very messy Oreo eater I would have to say. We had a chance to watch that Marley and Me movie with our papa Fredrick the other day and this weekend we get to go to the movies our Papa Paul and Grandma Debra. I think we are going to go see Hotel for Dogs. It should be a good time I think. That's gonna wrap it up. We need to get some lunch and check on our garden. Have a fun weekend everyone. Written on April 23, 2009 by Kevin. Here is a photo that Rylan took of Kaitlyn. Rylan was playing the role of paparazzi and Kaitlyn was the celebrity. 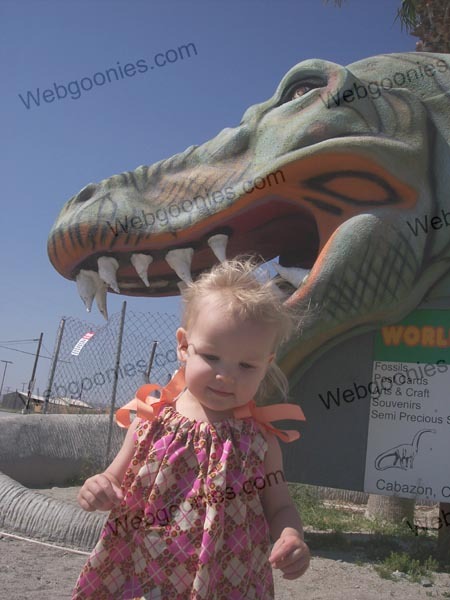 Kaitlyn and the Cabazon Dinosaur! Written on April 20, 2009 by Kevin. Here is Kaitlyn getting chased by the T-Rex of the Cabazon dinosaurs. We make sure to stop everytime we head out to California. It's a great way to photograph the kids as they grow. Written on April 17, 2009 by Rylan & Kaitlyn. Well of course this weeks best thing was celebrating Easter. 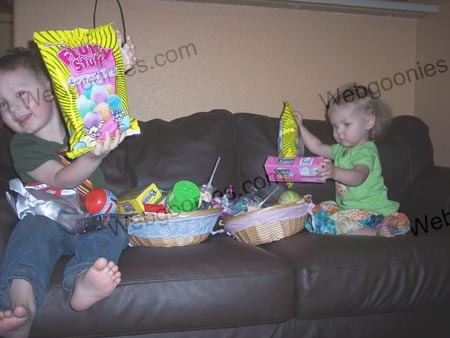 Our Mom and Dad decided to let us have our baskets actually on Saturday which was nice. Kaitlyn got a few of her new favorite audio CDs and I got a movie. Most importantly though we got a bunch of candy which was really great. As planned we bounced off the walls for a few hours. We celebrated Easter at our grandparents house and it was fun. 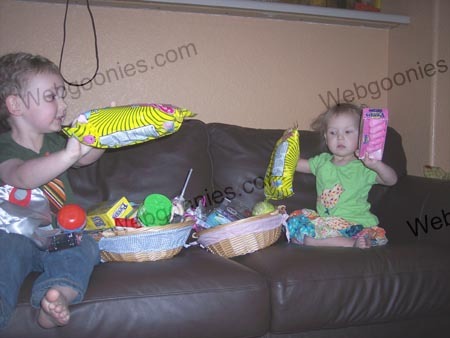 We were surprised when our grandparents and even one of our great Aunt's gave us a few gifts as well. We really liked doing the Easter egg hunt this year too. It really was a nice Easter but it sure was exhausting. Thanks Grandma for having a safe Easter meal that turned out perfect. The unfortunate discovery of the week has been that Kaitlyn is a biter. She had bitten mom a week or so ago and then just yesterday she bit me. She bit me really hard. She had to go on her naughty spot for a long time because she would not tell me sorry and give me a hug. Eventually she did though and I forgive her. Our mom has been learning a bunch of new safe techniques on how to make great looking cakes. We decided that because it was our Grandma Tina's birthday this week we would make her a cake. I got a chance to help make the actual cake and then help decorate it as well. 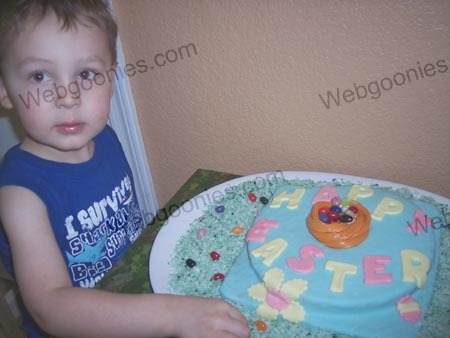 We use a safe homemade fondant that is really easy to work with and looks very professional. Mom has made only 2 cakes with it and she already is making million dollar cakes. Our neighbor now wants one for her birthday. I think our Grandma Tina really appreciated it and boy did it taste good. Oh before we let you go. Our dad noticed yesterday that our seeds are already starting to sprout. There are poking through the soil and they look so cute and tiny. I think that the garden will be really alive in another week or so. Until then.. have a good weekend everyone! Written on April 14, 2009 by Kevin. Written on April 10, 2009 by Rylan & Kaitlyn. Well a big thing this week was definitely the creation of our garden out back. Dad spent quite a while getting it all setup and we headed out to get all the necessary things for a proper garden. We bought a bunch of seeds and a few already grown flowers too. Unfortunately 2 of the plants have already fallen over. Hopefully they will come back. We like going out there during the day to water them and stuff. Oh boy let me tell you something. Those grilled cheese sandwiches that mom made us the other day were great. It really was nice to have cheese again and Kaitlyn really enjoyed it too. Mom surprised us even more the other day when she made a dairy free lasagna that was really really good. We ate tofu! Tofu that tasted like ricotta cheese. It was definitely a wonderful dinner that we got to have with grandma. She thought she wasn't going to be able to stomach the tofu but she ended up liking it a lot. Mom is a really good cook. So of course Easter is coming up in a few days. Mom has been on a hunt trying to find things to do. We heard mom and dad talking about nest cakes. I sounds like they are going to be pretty cakes. We are going over to our Grandpa Paul and Grandma Debra's house on Sunday to meet up with family. They are having an Easter egg hunt and everything. We are bringing carrot and potato salad. It should be pretty tasty. Well we are going to get back to helping mom with Easter stuff. Have a good weekend everyone. Written on April 9, 2009 by Kevin. With Kaitlyn's allergies, holidays can be a bit tricky. This morning my wife worked on homemade cadbury eggs and from what I hear, they turned out great. Egg and Dairy Free Cadbury Eggs! With a hand mixer or stand mixer, blend the corn syrup and margarine together until creamy, add in the vanilla and salt and blend again. Carefully add the powdered sugar 1 cup at a time and mix until creamy and smooth. Divide 1/3 of the fondant out and color with yellow food coloring. Wrap both colors in plastic wrap and refrigerate for 1/2 hour. Spray the insides of some mini plastic Easter eggs with cooking spray ( I found mine at Hobby Lobby for 50 cents!) Have fun filling the eggs, then put in the freezer for an hour or so before dipping. Slowly melt the chocolate chips and shortening in the microwave. 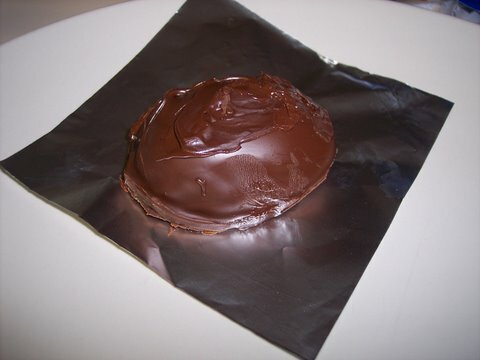 (The shortening helps thin the chocolate, and is a cheater's way to avoid the dusty "bloom" that happens when ill-tempered chocolate dries...I can't temper chocolate to save my life...so I've given up) Remove the fondant centers from the plastic eggs. Reshape slightly if needed. Dip! I actually did a double dip. First, I did a really messy thin coat to make sure all the fondant was covered and let them freeze again. Then I re-dipped in a more pretty fashion. Wrap in foil and store at room temp if you plan to eat them in a few days, otherwise refrigerate for a few weeks. Written on April 8, 2009 by Kevin. Here is Kaitlyn enjoying a common childhood lunch for the first time. It's always very exciting for us to find something that she can eat but this is especially great because it's so close to what we are missing that we aren't missing it any longer. This American cheese is made with soy but it taste like its dairy counterpart. She gobbled it right up. Written on April 7, 2009 by Kevin. We have setup a small garden in our backyard for the kids to take care of. Their job each day will be to water the flowers and make sure that they continue to grow. We have planted a few packets of seeds for them to watch and a few grown plants so they know what they can hope to see. They seem very excited about this new project. Despite the soil flung and the water fought after, I think this garden will be fun for them. Review time again. I was recently sent a copy of 2 new books by Leslie Patricelli. Higher! Higher! and Baby Happy Baby Sad which we have quickly determined are great books. Our first experience with them was reading Kaitlyn the Baby Happy Baby Sad book. This book is as simple as it can get. It shows moment where the baby is both happy and sad and as the parent you get the exagerate the fact. I love to give Kaitlyn a huge smile and a big pout when the baby is sad. She quickly picked up on this and just loves this book. The Higher! Higher! book also has been a great hit here. Just yesterday Rylan was reading it to himself and pointing out the characters along the way. The books are written very well and have great illustrations. They are simple but do seem to keep the interest of the children. I am definitely looking into buying more of these as I think they will be a good addition to the kids bookshelf. I would definitely recommend taking a look as well. Written on April 3, 2009 by Rylan & Kaitlyn. Of course the big thing we had done this week was going to Disneyland. We had a blast. We started the trip off by stopping back at the dinosaurs of Cabazon. They have built up that area even more now which was neat. The dinosaurs are just as cool as ever and we like taking pictures with them. We went to Disneyland for 3 days so we really took our time and had fun. Kaitlyn was quite a bit worried about all of the rides but I had a blast. I even got to go on all of the big rides as I was just at the 40" requirement. The only ride I did not get to go on was the Tower of Terror which was a bummer. I really wanted to go on that ride because it looked so fun. I really liked the Space Mountain and I have to say that I am one crazy driver. In fact, I am a crazy driver on all of the big rides. It was really fun going to the park. Kaitlyn took a few days to warm up to everything. At first, even the carousel terrified her. We were taking a rest and a leaf fell on Kaitlyn. Mom told us that she freaked out and was crying really badly. She is definitely sensitive. She eventually liked going on the carousel and went on it a few times the last day. We had some money in our piggy banks that we had gathered over the years. We took it to the park and we each got to pick out a toy. Kaitlyn picked out a Dalmation stuffed doggy and I picked out a bunch of pirate gear. Oh I think the best thing about this trip was all of the neat outfits that our mom made. She made us each a Nightmare Before Christmas outfit and even a Mickey Mouse shirt. 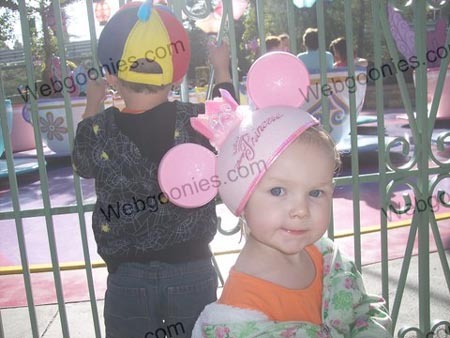 Kaitlyn's had a big heart with a pair of Mickey ears on top. I had a Mickey head with a pirate wrap on it. They were super cute and we really liked wearing unique shirts at the park. Well let's see what else we have been doing. Kaitlyn has been picking on me and sometimes being a nuisance lately so she recently had to go on her time out spot for the first time. 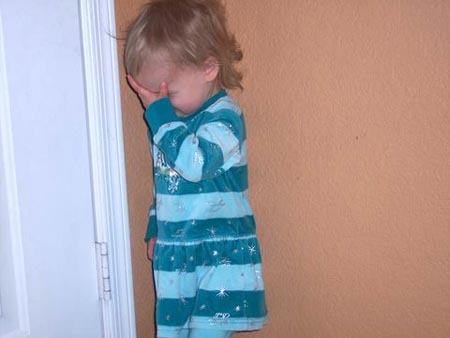 She hurt me so Dad took her over there and explained that she cannot do that. She sat there patiently for 1 minute without any issues. Afterward, our Dad had her tell me sorry and she did. Then she gave me a hug and kiss. It was cute. :) She definitely has been picking on me more lately so I guess it's a good thing that Mom and Dad are starting to use the naughty spot with her. At least I don't feel like they are picking on me now. Have a great weekend everyone. In the meanwhile, here is a video that our Dad found that you may find interesting. *** This gives you a glimpse of what it is like to be a child with allergies and how it makes them feel. We encourage parties with safe food so that we do not have a situation but also so that Kaitlyn can live as normal of a life as possible. It is important to her and us. This video really strikes you deep at about 4:00. Written on April 2, 2009 by Kevin.